In 2008, Reuben Chileshe met with a previous Hands at Work leader and was challenged by the call to help the poor and vulnerable children in Mulenga. Following this meeting, Reuben joined Breakthrough Care Group with a new vision to help the suffering children and patients in his community. Life was not always easy for Reuben; lack of employment opportunities forced his family, including his wife and four children to survive on the meagre earnings that came from selling small baked goods. In spite of these hardships Reuben was passionate and dedicated to his work and spent much of his time visiting the sick, spending time with children who lacked parental care, teaching at the local Community School and bringing the hope of God to those around him. Mulenga is a settlement within the city limits of the mining town of Kitwe, in the Copperbelt province of Zambia. According to 2010 statistics, the population of Mulenga has surpassed 30,000, with a large percentage under the age of 15. Most of the populace survives by doing unskilled, occasional work in the community; often leaving them with income too low to support their families. The economic struggles in Mulenga mean that few people can afford school fees, clinic fees and basic necessities. Often prostitution and addiction are perpetuated by very difficult financial circumstances. The devastating effects of HIV/AIDS have also significantly impacted the community. Family support systems have crumbled under these hardships and many men have abandoned their families. Children are often left without systems of support or adequate parental care. Hands as Work became involved in Mulenga after James and Sukai Tembo identified the community’s desperate circumstances. Pursuing the vision to serve the poorest of the poor across Africa, Hands at Work began partnering with Breakthrough Care Group in Mulenga in 2008. The first three-day Maranatha Workshop for the Primary Caregivers and sixty youth was also held in 2015. Once the word spread about the transformation happening in the lives of caregivers, many people from the community lined up outside the CBO to receive prayer. Youth Leaders from Mulenga meet every few days for Relationship Groups, as well as meeting regularly with Youth Leaders in another community, called Mwaiseni, to encourage and pray with each other. Breakthrough Care Group is currently caring for 185 of the most vulnerable children in their community, providing them with a daily nutritious meal, access to education through the Community School and basic health care. Weekly home visits to the children allow the Care Workers to build up strong relationships, enabling them to support each child physically, emotionally and spiritually. This also helps them to accurately assess each child’s needs and make a plan for how to best intervene and provide sustainable care for them. Following his mother’s death in 2005, 10-year-old Anthony* lives with his father and stepmother. He is mistreated by his stepmother, and suffers from epilepsy and the lack of mobility in one of his hands. Even though he does not receive adequate food security from his parents, his Care Worker, Elizabeth, has stepped in. Now, Anthony is fed by the CBO and spends most of his time there, soaking in the Christ-like love of the Mulenga Care Workers. The Hands at Work office in Kitwe currently supports seven Community Based Organisations, which exist to care for the most vulnerable in their communities. The office provides training, networking, and encouragement to those Community Based Organisations like Breakthrough Care Group. It also gives administrative support, including helping with funding proposals, monitoring and evaluation, bookkeeping and reporting to donors. When Peter* was eight years old, he was one of the most vulnerable children who was brought to the Mulenga Community Based Organisation. Here he began to receive a hot and nutritious meal daily and support with his education and health care, along with over 170 others. The children are supported for by Care Workers, who are committed to holistically providing for them, bringing emotional, physical and spiritual transformation into their lives. Today Peter is 18 years old and completing grade 10 at the local high school. Attending the Care Point has transformed Peter's life. Peter has a strong faith and has a desire to bring Godly transformation to his community, which has poured out and into the other youth who attend the Mulenga Care Point. 175 of the most vulnerable children in Mulenga receive a daily meal, access to education and access to basic health care. The Care Workers are committed to bringing life and God’s love to the children they serve; giving them a reason to smile amidst difficult circumstances. 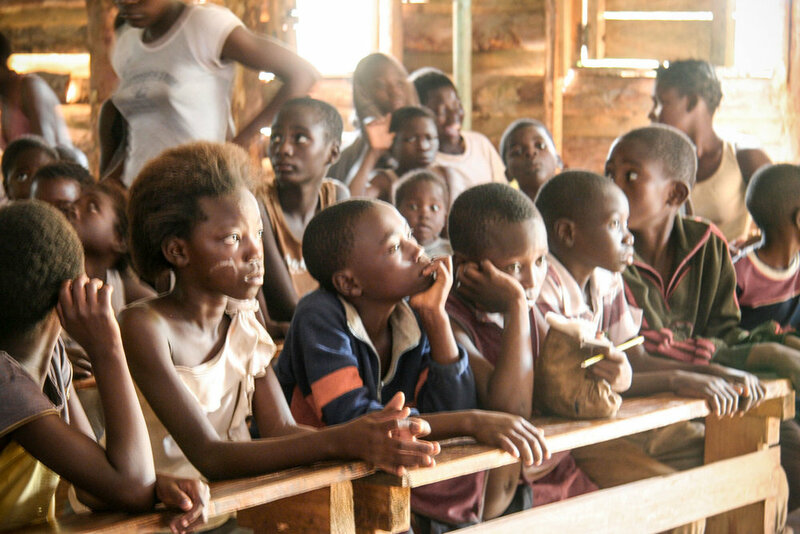 At the Mulenga Care Point, there is a community school where the children are taught. Through serving and working with different people, I am a changed person. Not just in the communities, but in my family. I am a leader at my church because of the things that I have gone through and now people can trust me. If I was where I had been, than maybe I wouldn’t be alive, but God saved my life. That's why I also want to serve, to give life to other people. In early 2015, while visiting children on Holy Home Visits, Care Workers came across Clement and his siblings once again. The children were begging for food and the four of them looked malnourished and unwell. The loving Christ-like hearts of the Care Workers compelled them to follow the children back to their home and find out more about their situation. Hands at Work are in the process of evaluating how our Community Based Organisation’s (CBO) will operate across Zambia during this season under the current government regulations. We are looking at alternative solutions to ensure the most vulnerable children continue to have access to important daily services. We do church mobilisation to build a relationship with the pastor because we want to hear their challenges, encourage them and show that we care. When people feel safe, they open up and engage in what God is doing in their community.